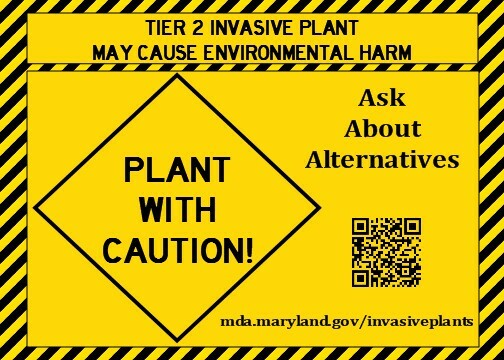 An "invasive plant" is a terrestrial plant species which did not evolve in Maryland and if introduced here would cause or likely cause economic harm, ecological harm, environmental harm, or harm to human health. The decision to consider a plant an invasive plant species is the determination of the Secretary of Agriculture. (§ 15.06.04.02). To sum that up, any plant not native to Maryland and with the potential to harm the State if introduced will be considered an invasive plant species. These regulations just went into effect on April 11, 2016, with the Tier 2 provisions becoming effective July 11, 2016, and many of the Tier 1 provisions becoming effective April 11, 2017. To learn more about the new restrictions and future changes, MDA has a dedicated web page available at http://mda.maryland.gov/plants-pests/Pages/maryland_invasive_plants_prevention_and_control.aspx.